I just listened to a very insightful Amy Porterfield podcast interview with Chalene Johnson. This is the second interview I’ve heard with Chalene Johnson where she explains the importance of separating our personal photos from our business photos on Instagram but, for whatever reason, it just clicked for me on Amy’s interview. I’m sure we can take the lessons from Chalene Johnson’s advice for other social media networks but I want to focus on Instagram for now. So after I’ve posted over 500 photos on Instagram with my business profile @HotBlogTips, most of which are of personal nature, that interview has convinced me that I need a personal account that is separate from the account I use on Instagram for business. So, just minutes ago, I created @brianDhawkins. I am SO glad that my name was still available and would have kicked myself if it was too late. 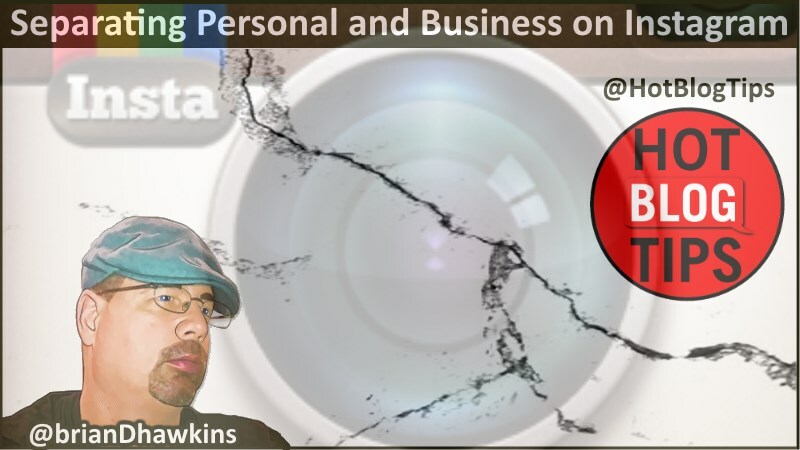 So why should we separate Business and Personal images? First, let me explain my reasoning why I thought I should mix business and personal photos into one account because I’m betting you were thinking the same thing. I thought Instagram would be the perfect place to allow an “inside” look into my personal life for my social friends and connections. Makes sense, right? Wrong. First, we need to offer exactly what people followed us for. Second, we should be seeking new followers that aren’t already following us, especially when focusing on lead generation. Think about it, you’re never going to love my dog Sadie as much as I do and she isn’t why you might follow Hot Blog Tips on Instagram. You might love blogging as much as I do and find value in the tips I share so that is why, more than likely, you would follow Hot Blog Tips on Instagram. That doesn’t mean we don’t have many interests but for the personal stuff, wouldn’t it make more sense to offer it on a separate account, especially when we should be using the power of Instagram to connect with a brand new audience? Sure it would and that’s exactly what this blogger is going to do. I already have two separate Instagram accounts for two different blogs but now I’ve added a third. Up until now, it’s not been a huge issue because I actually carry two smartphones. Yes, I am THAT geeky. I have a Galaxy S3 and a Galaxy S5, each logged into a separate Instagram account. I’m not willing to add a third phone to the mix so I started searching for an easy way to manage two or more accounts from a single app. Chalene even addressed this issue but I was sure there had to be something but, for right now, there doesn’t seem to be a perfect solution. I did find Phonegram but that only allows me to upload a photo to which ever account I’m already logged into on the Instagram app. I also found a workaround that I haven’t tried because I don’t want to risk downloading apps outside of the Google Play Store. You can find that workaround at How to Use Two Different Instagram Accounts at the Same Time on Your Android Device. Resource notes: Here’s a little about Chalene Johnson to put things into perspective. This should lend her some credibility as well as offer a little insight to her success; I don’t want to mislead you into thinking we can easily duplicate her Instagram success. With that said I believe there’s a lot of value and potential in following the success of others and this is a prime example of someone worth looking at. Chalene’s main Instagram account where she has over 379,000 followers. Chalene has four other Instagram accounts with an additional combined following of 150,000. Chalene has a staff to run all but her main account so that’s something to consider. Chalene is a bestselling author and physical fitness celebrity in her own right, including infomercials. Since now have a new personal Instagram account with zero photos, I thought it would be fantastic if I could move or transfer the personal images from my Hot Blog Tips’ account over to my new account. It doesn’t look like that’s possible but I was able to backup all 534 photos to my harddrive using Instaport.me. I then dropped those images into Dropbox for easy phone access. Now I can choose which photos to re-share using my new personal account at my leasure. I won’t start deleting old personal images from the HBT’s account but I will focus on blogging, social media, and content creation related posts for that one in the future. Are you on Instagram? Why do you follow the accounts you’re following? Here’s the BIG ONE – are you connected with the same people on Instagram that you are already connected with on many different social networks? I know I am. There’s nothing wrong with that but, in my opinion, Chalene Johnson is correct in that we should be using the network to find new followers while being very focused on relevant content. What are your thoughts? Are you connected with the same people on Instagram as you are on other social networks? Why? One last thing, would you consider connecting with me on Instagram? For blogging and online business content, follow @HotBlogTips. For my personal side, follow @brianDhawkins. I’d love to connect with you on either or both accounts.